Among the cruelest truths of biology is this: A dog's life is considerably shorter than a human's life. The math is unforgiving; if you love a dog, you will lose a dog, and you will suffer the pain and biting lessons that death brings — probably several times over. A million things are wrong when your dog dies. Here's just one: You become invisible. My Lucky passed away a year ago this spring and my loss was profound; those of you who've been through this understand; those of you who haven't, I'm not nearly a good enough writer to describe it to you. My grief was complicated because, as my reporting sidekick for many years, Lucky was a mini-celebrity. He had completed several cross-country trips with me as we chronicled American life. We even had a theme song ("It's Bob and Lucky's/Hidden Fee Tour of America!"). He was a fantastic journalist. And he died suddenly, just as we were going to leave on a new trip, so I had the task of disappointing readers and sources from coast to coast, telling them that Lucky wouldn't be sticking his head out my Jeep window this time. But my sadness grew even deeper as I realized that my entire life, right down to how I interact with the world, had changed. Pet owners know the “You’re Fido’s owner!” phenomenon well. Plenty of neighborhood folks knew me only by my dog. They knew his name, not mine. When he passed away suddenly, I felt like I'd disappeared. I wrote a column about turning to social media for comfort in my time of grief. It was among the most popular pieces I'd ever written, even though it had nothing to do with my day job. No question, the Internet helped. But Facebook friends and retweets are a meager replacement for the dozens smiles and laughs from strangers that spoiled me daily, thanks to Lucky. They were gone now. Walking my old Lucky around the block was like going to a never-ending cocktail party. Everyone would stop for a pet, and a chat, and 30 minutes later I had 10 new friends. Now, I would arrive home from work, dreading the thought of walking into an empty apartment, and set out to walk around the block. I got in the habit of taking the slowest stroll I could, as if I'd become the aging geriatric dog that Lucky never got to be. It wasn't just my heart that hurt; it felt like every muscle of my body suffered a dull ache, as if my blood didn't really have the heart to push its way through my veins any more. But that wasn't the worst of it. The worst was the blank stares. If I did, occasionally, work up the strength to smile at a sidewalk passer-by, I'd get an odd look, if I got any response at all. There certainly was no stopping for idle chat. Sure, some neighbors I knew better did pause and ask me how I was doing, but it wasn't nearly the same. The party was over. In the 1960s, psychiatrist Eric Berne introduced a new model of psychology that he ultimately called Transactional Analysis. It has many components, but the simplest is this: Our days and nights are filled with small and large "transactions" between people. A quick hello from a friend is a small, positive transaction, while a dirty look from another driver is a negative one. A deep conversation with a lover is a large transaction — it might be positive or negative, depending on the outcome. Berne believed that people's happiness was a function of how these transactions went, and how many positive interactions a person piled up during the day. He believed that positive transactions were as important to mental health as water and food are to physical health. Chart a few days of your interactions with people, and I think you'll become convinced that Berne was onto something. When Lucky died, I lost probably 100 or more happy transactions every day. The ache I felt was primal. Berne would say I was starving. OK, I'll say that. As pet owners know, you can't just replace your lost loved one. Pets aren't like cars or refrigerators. The timing is different for everyone, but you must wait until the time is right, lest you cheat yourself out of that critical soul-searching "in-between time," and you cheat your new dog by expecting the pup to be too much like your old dog. So I waited a year....past the point when every day was a sad anniversary...and mentioned to a friend that after a long summer vacation, I thought I'd be ready to love again. During my trip, she found Rusty at a shelter, facing an uncertain end. When I got home, he was, essentially, waiting at my door for me. You become visible. Dogs make you somebody in the eyes of the universe. Maybe the isolation I felt after Lucky died says something about alienation in modern life, and the fact that people would rather text than smile while walking; or about the cruelness of urbanity, the heavy social armor city-dwellers must wear to protect themselves. Or maybe it just says people in some places aren’t friendly enough. Whatever — dogs are the world’s best icebreakers, and that can’t be argued. I don't know a lot about Rusty's past, but I do know he hadn't been on a leash very much before meeting me, and I'm pretty sure no one had ever told him to lie down. As a roughly 8-month-old golden retriever, Rusty is at the age that often gets dogs in trouble. Dogs’ bodies grow much faster than their brains. Rusty is almost full-grown, but he's still very much a puppy. That means he has puppy fits, when he wants to jump on everything and everyone, he wants to steal food, socks, remote controls, and anything else that I don't want him to steal. If he's not getting what he wants, he literally bats people — in the face, even! — with his paw. He can't resist trying to wrestle with every dog we encounter. In short, he's doing things that would be adorable if he were 15 pounds, but are dreadful now that he's 50 pounds. This is the age at which many dogs end up in shelters. 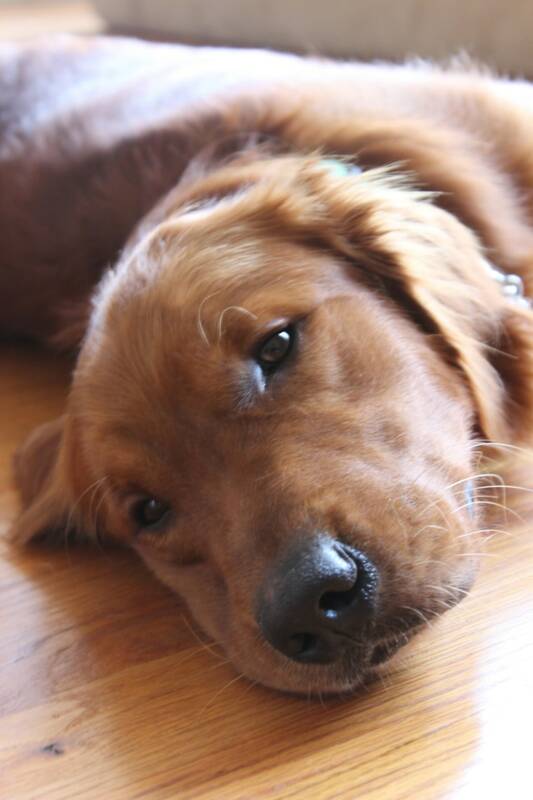 But Rusty is also a beautiful, auburn-red golden retriever who melts hearts as easy as he chases tennis balls. Passers-by can't resist patting the fur on his soft, soft head. The second someone shows the slightest bit of interest ("What a cute dog! He's so red! What is he? ), he hurls himself onto his back, on his "victim's" shoes, and demands a belly rub. One block=30 minutes. At least. And at least 100 or more smiles, hellos, handshakes, how-do-you-dos, etc. An NBC colleague often reminds me that golden retrievers are the bartenders of the dog world. True, but I know Rusty isn't just being friendly for the tips. Transactional therapy has few real advocates now. It's viewed as old-fashioned and incomplete. But you'll find fewer more thought-provoking books than Berne’s "Games People Play," which describes the stunts people pull (rackets, Berne calls them) to fill their emotional needs when they aren't being filled through normal daily life. Since learning about it years ago, I've often thought about the troubles of suburban life in America. It's possible to walk from your house into your garage, drive to work, pull into the office garage, and take the elevator to the cubicle without ever interacting with another human being. That life might not be sad, but it's certainly not happy. Berne would say it's like trying to get through the day without eating. Follow Animal Tracks on Pinterest! I'll just say that, according to the American Humane Society, 61 percent of U.S. Households are dogless, and that number is creeping up slightly because of the recession, as some people give up their pets for financial reasons. Those folks might not know what they're missing. It's been about a month now, and Rusty has changed everything. I’m unmistakably visible — particularly to friendly folks my dog pees on when he gets so excited as they are petting him that he literally can’t contain himself. Last Sunday, walking down the block, a small puppy and his companion walked towards Rusty and me. Our dogs played, while we chatted. Then, a man walking two other dogs arrived. More playing, more talking. A petless woman we'd met the day before, who missed her childhood dog, strolled up and joined the fun. Then, an older woman and a pug nicknamed "Piggy" snorted their way towards our dogpile. I mean, our spontaneous cocktail party. I loved every minute of it; my heart was filling up. I'm sure Lucky paused from chasing a tennis ball in heaven to smile down at the scene. To those who walked this walk with me, who contributed to my So Lucky dog memorial page, thank you. To anyone who feels invisible, or even sad — the ASPCA estimates that 3 to 4 million dogs and cats are euthanized every year in the United States. The life you save may be your own.